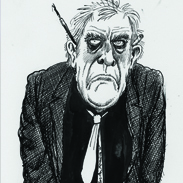 Martin Rowson is a multi-award winning cartoonist and writer whose work has appeared regularly over the past 30 years in The Guardian, The Times, The Daily Mirror, The Independent on Sunday, The Irish Times, Time Out, Tribune, The Spectator, The New Statesman, Morning Star, The Daily Express and many other papers & periodicals. His books include graphic novelizations of The Waste Land, Tristram Shandy, and Gulliver’s Travels, while Stuff, his memoir about clearing out his late parents’ house, was long-listed for the 2007 Samuel Johnson Prize for Non-Fiction. Formerly Ken Livingstone’s Cartoonist Laureate for London (in return for one pint of London Pride ale per annum, still 6 years in arrears), Rowson is also the vice-president of the Zoological Society of London. He and his wife live in southeast London and have two children in their 20s who drop round occasionally.